I just finished washing my windbreaker/rain-jacket in the shower with a heavy-duty cleanser. Ever since the jungle, it’s never quite smelled right… That reminds me, I never did journal/blog about that part of Nepal. First off, it meant another day on the highway, exhaust pipes of endless and uncountable trucks pumping that cartoonishly thick black smoke. With the heat and the wind I expect the first drops of the next shower to turn dark like the drops of spilled coffee drying on the side of the cup. If you pick your nose after a day on that highway it comes out like a little black worm, all muddy and smudgy. The trucks are all junky old things that have been patched together innumerable times, and don’t manage much speed, which I guess is why they tend to pass on the right, on a two lane road, as they go around completely blind corners. It’s a slow motion maneuver, and they often get back into their lane with a few feet of space before the next oncoming behemoth. There’s nothing you can do about this practice, so you sit back and trust your luck, but on the trip to Chitwan one of the other volunteers was napping, opened his eyes and looked out the front windshield to see a massive dumptruck headed straight for us, nice and close. With the truth serum of sleep making him honest, he shouted “Oh God!” as the truck swerved back onto its side just in time, the wind of its close passage shaking our bus. Chitwan National Park (the name comes from Sanskrit for “Heart of the Jungle”) borders a wildlife reserve to the east and an Indian National Park to the south to form 800 square miles of verdant jungle packed with a soul-uplifting variety of animals, the most famous (charismatic mega-fauna) are rhino, crocodile, sloth bear, and some cat thing called a…what was it?…tiger. We saw the first two, and enjoyed staring into the jungle for the second pair. 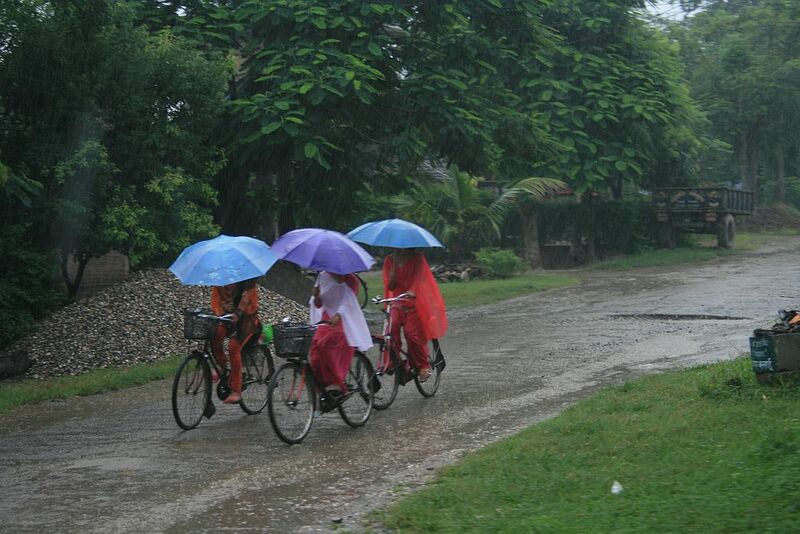 Chitwan gets something like 2,500 mm of rain during the monsoon season, which, for us non-metric people is equivalent to 1.3 shitloads of precipitation. The humidity when the sun comes out turns it into the interior of a rice cooker. You strip off your rain jacket and swelter, then when a nice fresh breath of air comes you enjoy it then put your raincoat back on because the rain follows that wind by about 30 seconds, and feels pretty darn good. On the edge of the park is the small town of Sauraha, where we went for the things tourists need, namely souvenirs, bottles of water, and an ATM. Tourism has developed one street to provide these things, which has earned the nickname “Little Thamel”. I see what they mean, but elephants don’t casually walk down the street in Thamel. There are a lot of elephants in Sauraha; between the breeding center, an anti-poacher ranger force, the ones at the park for safari’s, and the ones owned by hotels, I’m (very roughly) guessing there must be about 60 elephants living in that little town. We were only there a couple days, but it is surprising how quickly people get used to seeing elephants wandering around. I must be a city-yokel because I just couldn’t get over these massive animals, looking at you both warmly and impassively, and always with intelligence. One of the tourist activities is bathing the elephants in the river, but the pouring rain makes the river dirty and the elephants don’t like it, so for our elephant bath we watched it following the mahout’s barked instructions to fill its trunk from a well-pipe, then spray it over its back and us, while we scrubbed its skin with pieces of broken bricks. Now that’s micro-abrasion skin therapy. We found a couple big purple lumps that seemed different, but didn’t come off when we scraped them with the bricks. 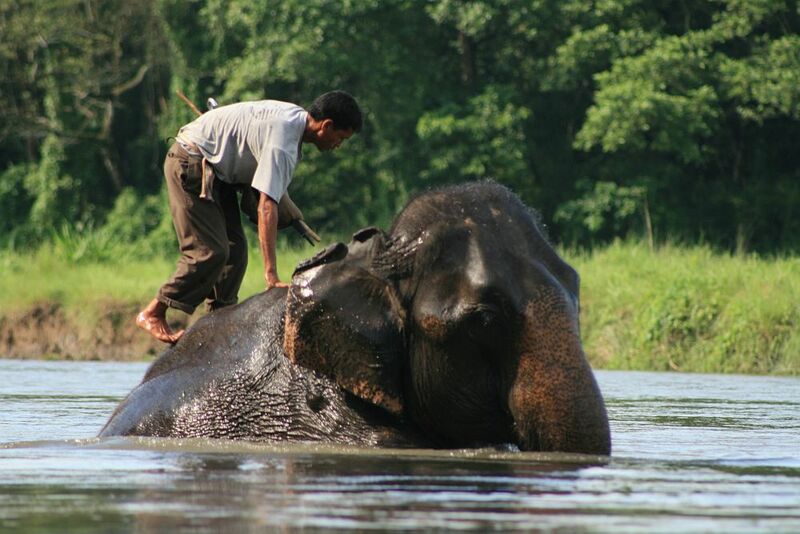 It’s hard to get leeches out of elephant skin, the mahout really had to twist and yank the things. 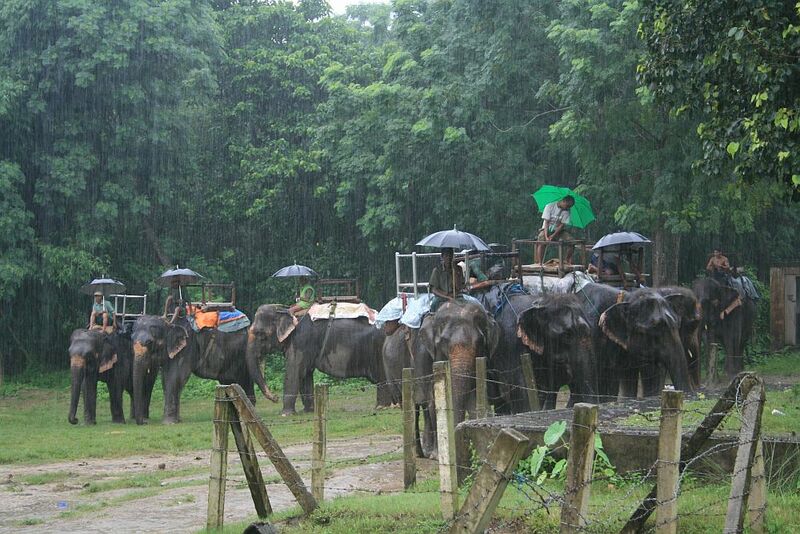 Another tourist highlight is the elephant-back safari through the jungle. The movement of those things is tremendous, ponderous, and unique. It was pouring down rain during ours, so no pictures after these first couple, which is a bummer because we sat a couple meters away (ie above) a mother and baby rhino, eating rain-washed leaves and looking slightly bored with us. We saw a couple different types of rather stunning deer as well, but no tigers or sloth bears, which may be good since sloth bears go for your eyes when confronted with humans, and their massive claws tend to remove most of the face. At one point the elephants apparently didn’t like something? The mahouts were trying to lead them in one direction and they stopped and all started trumpeting, balking and shying away. It was beautiful, stunning, and more than a little freaky, sitting on one’s back while it is obviously agitated. Did you know they used the sound of an elephant trumpeting for a large portion of the T-Rex roar in Jurassic Park? You can hear it. Then there was the worst part. Have you seen/read Like Water for Elephants? You know the stuff about the bull hook? 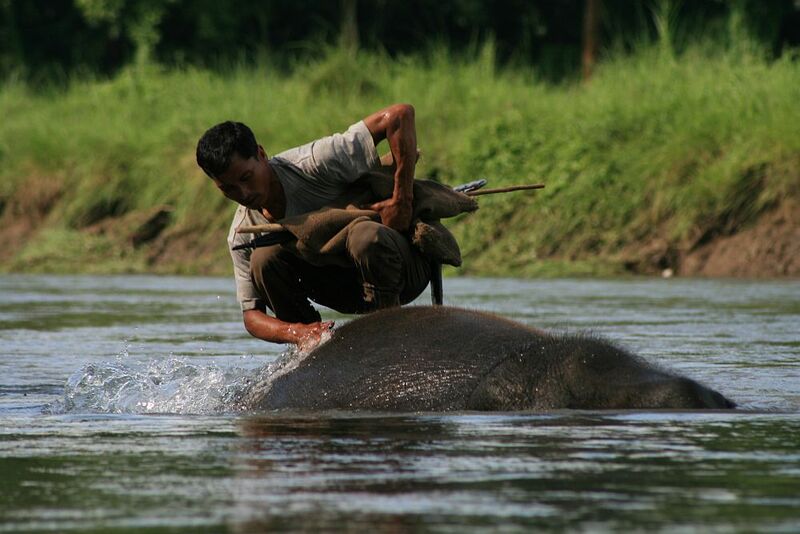 The mahouts mostly carry stout sticks, though some have the vicious metal spike and barb weapons, and they whack the elephants on the top of the head with them. Hard. Really hard. I tried to convince myself they have such thick skin that they could barely feel it, but when struck they make a crying sound that was one of the worst things I have ever heard. It is so full of feeling, and made me think of a child being abused and not even knowing why. 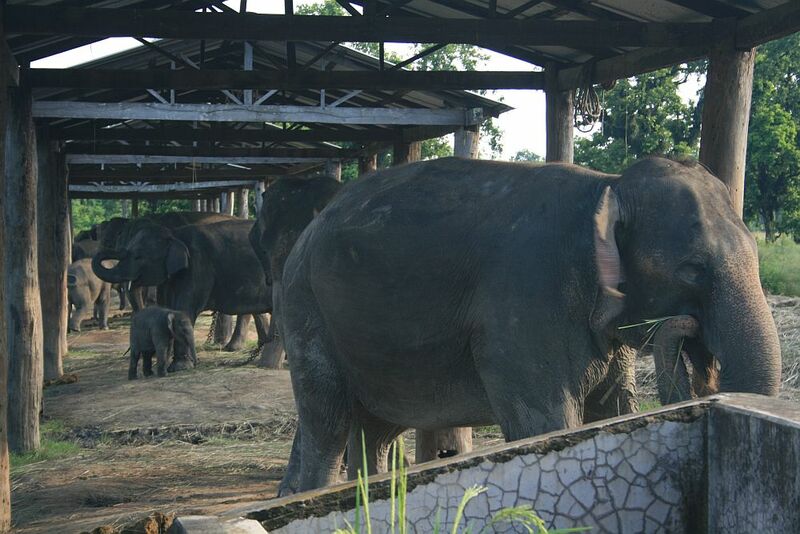 As our driver hit our elephant we could feel it shaking, and the vibration of its cries running through our bodies. I don’t want to travel to a new place and start telling people how to be, but it was horrible. We made our dark looks and remonstrances as loud as possible without being confrontational, hoping it would dissuade him from further use, hoping customer displeasure can change the practices of centuries. I assume they are used to the squeamish looks from tourists, but hopefully it will have an effect? We also took a couple walks with our hotel guide, Laxman, who had a weeping abscess or something on his foot. It had a big swollen lump, which he had drained but didn’t go away, so it just leaked fluid continuously, and the swelling was reaching up his foot in a new direction in a big bulb of inflated skin. When we would stop and all be looking at something, he would bend down and poke at it. I don’t really like that role, but at one point I was talking to Laxman while one of those “okay, now with my camera from this side, now that side, now underneath” sessions, and he got a call from the hotel boss, yelling at him to hurry us up and get us back in time for the next event. I could see the helpless worry in his eyes. The boss can fire him any time he feels like, on the spot. There are very few jobs there, if you get one, you have to hold on to it. Laxman’s foot must have been searingly painful, but he kept leading tours, every day. He misses a tour, he doesn’t get paid. He misses a few tours, he gets fired. We miss an event we paid for, even if it’s our own fault, and he gets in trouble for it. 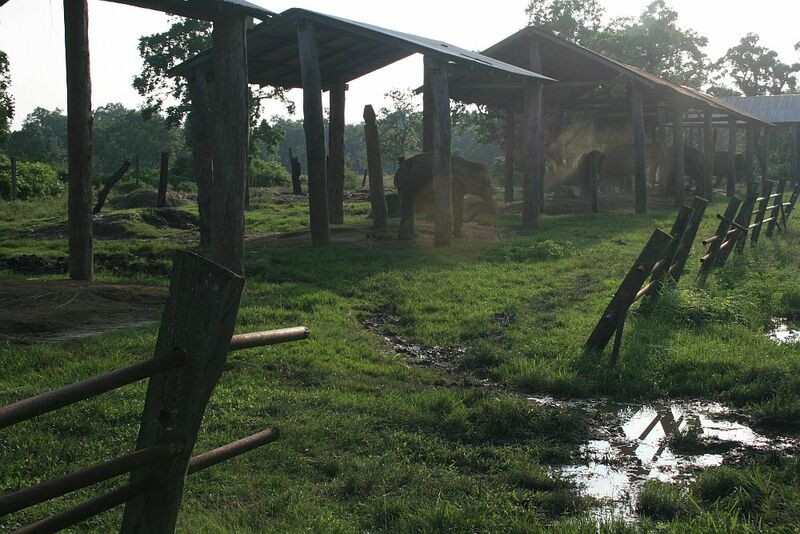 We went to the elephant breeding center, which is one of the few other employers in the area. Plus, it is a government job, so includes a pension, which is practically unheard of in Nepal. Those guys spend a lot of them time up in the trees, gathering firewood and fodder, and the interview for the job is who can climb up and down the fastest. The competition is so fierce, these guys running up and down the trees, that injuries and even fatalities are common. The breeding center has about a hundred staff, and the job of cooking that much dal bhat twice a day was killing the cooks after only a couple years, so nowadays they have a rotating work schedule, with a different team each night responsible for the largest pots of rice I have ever seen. The breeding center has a line of females (cows) and they initially brought in one bull once a year. Eventually they would have had to worry about inbreeding, but that problem has solved itself since for the last decade or so, all the babies born there have been the result of incursions by wild elephants. Laxman was telling us about one bull who stays nearby, and has learned about the load sharing and power outages. He waits for the perimeter lights to go out, knocks over a section of the now un-electrified fence, and visits his girlfriends. This is an incredibly powerful animal, and seeing entire sections of the steel fence that he had bashed out was impressive, to say the least. The center has a pair of young twins, which are extremely rare, and a younger one who was ridiculously adorable. I did not know something that size could be such a…kitten. They have a dance they do when they want food, rocking forward and back, alternatively lifting a front foot then the opposite rear one. They know when mealtime is approaching, and as we walked down the row, most of them were doing this rocking dance. Pachyderm choreography. The baby will do the dance at an adult elephant if there’s no humans around. Somehow I don’t have a good picture of the little guy, but you can see him in there, back a bit on the left. He could roam freely, but all the adults were chained at the ankle. I was not sure how I felt about the use/exploitation? of these incredible animals. They are well cared for, and Laxman was telling us about one old bull who was retired and set free in the park, but kept coming back to live at the center. You can choose to see that as dependency and domestication, or as friendship (and comfort)… The only ones I saw being mistreated (in my judgement) were the safari ones, who are kept under such strict discipline, perhaps because they’re carrying a load of Nepal’s only income on their backs. 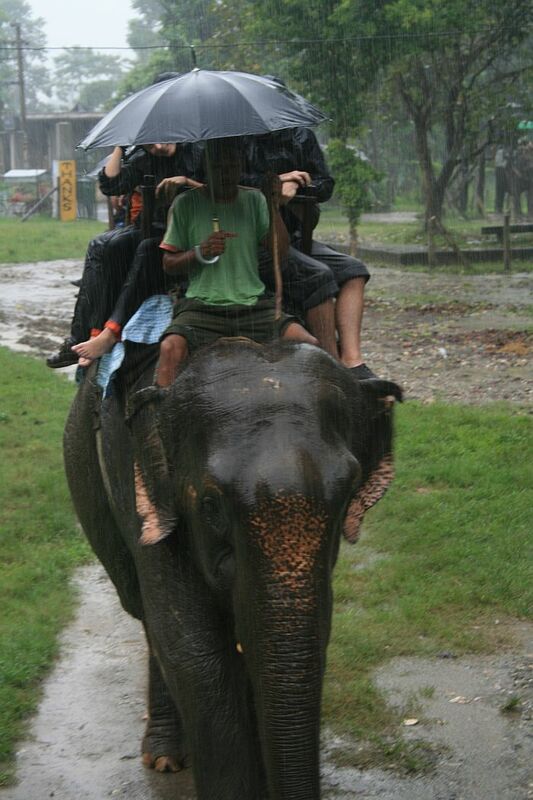 So no tigers on our jungle trip, but as you can probably tell, I was fairly enamoured of the elephants. We took a canoe trip to see some crocodiles and gharials, which were cool too, but I remember most clearly the site of coming around a bend to find a man standing in the middle of the river. On top of it. I was wondering if we had found Jesus (and surprise, he’s Hindu!) but then I noticed a smooth curve of rock beneath him, and a small one off to the side. Of course, the one he was standing on turned out to be an elephant’s side, and the small one was the tip of its trunk, which was made clear a second later when he barked a command, and the entire massive animal lunged upward out of the water, rolling to its feet and up onto the riverbank in a display of power and majesty that left me breathless.